There are so many beauties in the Tanks of the Month ancestral portrait gallery that I still can't believe mine deserves a place beside them. Well, it seems to be true, and I am happy and thankful for being chosen. If for some reason I wake up and discover it to be a dream, it will have been a really good one that made my day! 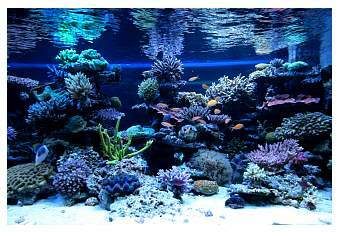 As a child I kept a freshwater tank for many years. It's funny, though, while writing this that I can't remember why I stopped keeping it. Hmmm, maybe other things kept me busy and it was my parents who said something like, "Clean it up or shut it down!" I took my time approaching things this time. About 14 years ago, after a period of not thinking about tanks for quite awhile, it happened. I was at the local fish store (a huge place with hundreds of freshwater tanks), which I visited out of curiosity to take a look at the place again. I remembered it from my childhood to be almost like a zoo. What can I say... it had a reef tank and lots of corals and fish that I had never seen before, and their employee had enough time to explain things to me. Following this was a period spent visiting all the local fish stores and public aquariums with coral reefs that I could find (there were not many of them in northern Germany), as well as various attempts to acquire some relevant literature to gather more information. Finally, I started my first reef tank. 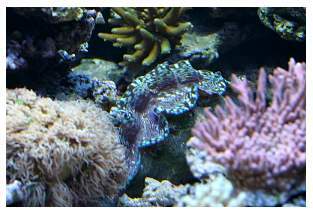 (I think the guy from the LFS still remembers me from those days.) It had a used, but too small skimmer and a large trickle-filter like ones I'd seen in one of the books I had acquired. It took me quite some time to understand that throwing out the trickle-filter alone would mean better water quality and lower nitrate levels. 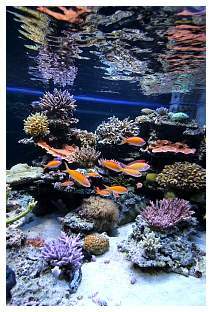 I also learned that buying used equipment is a good idea if what you're now using is no good and you don't know what you need; at least it is if you buy things from people who stopped reefkeeping because they didn't successfully run their tank with the equipment you're prepared to buy. 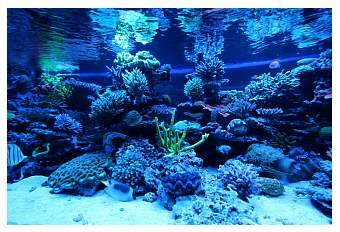 In the years that followed I became more and more accustomed to the tank's requirements, and more information on stony corals became available to me. Unfortunately, I had a total system crash due to a power outage caused by an old, defective heater. 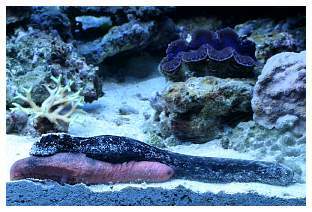 I then began using a calcium reactor and performing calcium, alkalinity (and later magnesium) tests and using bigger skimmers. 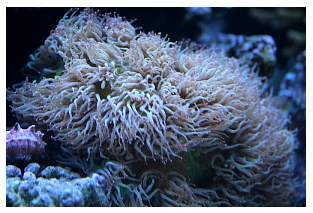 This laid the groundwork for keeping my first small-polyped stony corals and gave me the courage to try a bigger system. I thought that after building and running my new 90-gallon system (shown above), I would never, ever have to think about getting a larger tank. 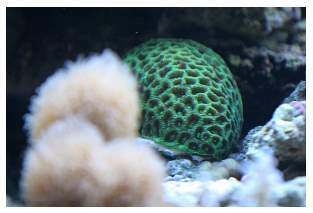 This one was so huge, and the corals were growing so well and so fast, that I thought it was all I would ever want. Two years ago, I had the opportunity to buy a house and renovate it from scratch. Looking at my crowded, way too small tank, I had no choice: I desperately needed a much bigger tank! And, the new one would be so huge that I would never, ever have to think about getting a bigger one. In my opinion, all the technical equipment should be unobtrusive, hidden and quiet (at least if not used to make sound), and simply should work. There was no choice, then; the new system would have to be an in-wall design. Fortunately, the living room was flanked by a relatively small room, a former study with no cellar directly under it and a solid concrete floor. The initial obstacles such as, "there is no water plumbed into this room," "the door is on the wrong wall," "but there is under-floor heating in this area" and "there's not enough electrical power here" were subject to immediate change. What was discussed more extensively was the question, "How big can it be and still leave enough room for the equipment, while looking harmonious from the living room?" Discussing this with the planners, who helped renovate the house, and Michael, who got the job of building the tank, the answer was found, and it's been up and running for about a year now. 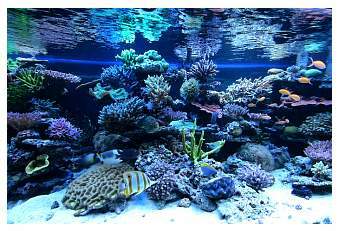 The tank is approximately 9.8' x 4.3' x 2.8', which means it contains about 870 US gallons (roughly 3 meters x 1.3 meters x .85 meters = about 3300 liters). The front glass is made of LSG (laminated sheet glass) for security reasons. The LSG is made of OptiWhite glass with a reduced iron oxide content, which does not have the green color typical of normal glass. 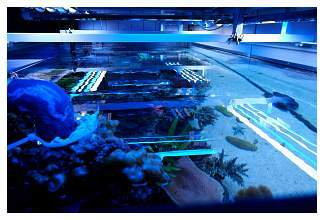 All siliconed joints are covered with additional glass bars to keep the critters away from the joints and to hopefully ensure the tank is leak-proof for many years to come. The stand is made of V2A high-grade stainless steel and was screwed into the concrete prior to pouring the cast plaster flooring. A 2" waterproof birch multiplex board, as well as some foam material, is glued in place under the tank to help distribute the load of the tank. The tank's cladding was made by the carpenter who did most of the woodwork in my new home. The color and style fit perfectly with the rest of the room, and the brushed steel shadow-gap around the panels is found in other locations of the house such as around the fireplace, etc. 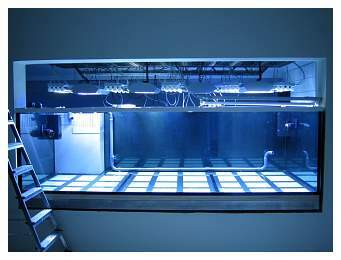 Front access to the tank is provided by the two big panels above it, which can be lifted with the aid of a pressure-cylinder (photo above right). Click here for a slideshow of the tank's construction. The tank's back glass is covered with 3mm thick black PVC foam from the local hardware store, which is sold for various handicraft purposes. 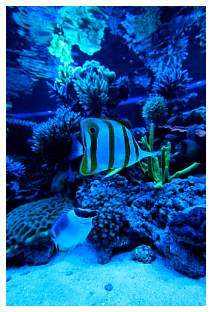 I wanted to be able to look into the back of the tank, behind the rocks, to search for lost fish, critters, etc., because being unable to simply take a lamp and look behind the rocks made me nervous (see photo below). As these panels are made of PVC foam, they can be easily cut to size. I have three of these plates behind the tank, and secured a "U-shaped" bar of PVC using PVC glue to the top of each with the "U" opening pointing down; the "U-bar" is made of two "L-bars" glued together. 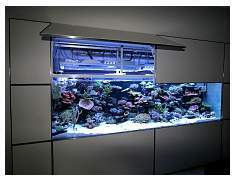 With this configuration I can hang them onto the back of the tank or take them away as needed. 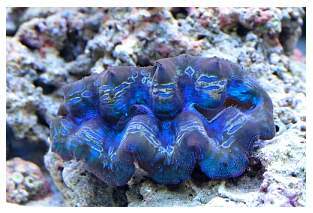 Their dark blue color is achieved by using a self-adhering contact paper, called D-C-Fix, in a "marine-blue" color, a material that's typically used to spruce up old furniture. 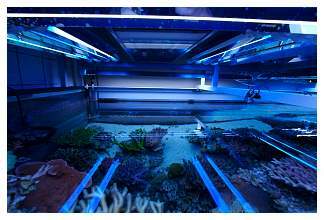 A view from behind the tank with the panels removed. 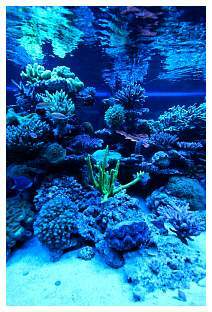 Directly connected to my desire for a stony coral dominated tank is the need for a lot of light. 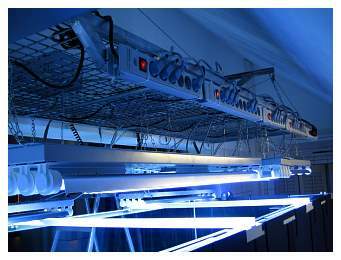 A light hood for the large number of lamps would have to be temperature resistant and air/heat permeable. 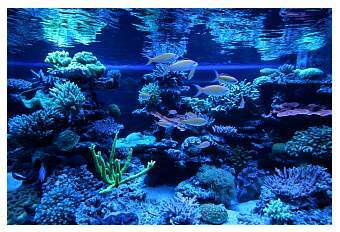 It's also important for it to be moveable, because I cannot play around with all those lamps for half an hour just to be able to reach into the tank. Unfortunately, the room behind the tank has an angular roof, so the usual design of a hood that slid away on tracks would not work. Well, the height of one side is constrained by the slanted wall behind it so we decided on a high-grade stainless steel hood with hinges on that side. Thinking about something saltwater resistant to lift the hood on the other side, we used a winch from a sailboat supplier for that job. It actually works quite well. 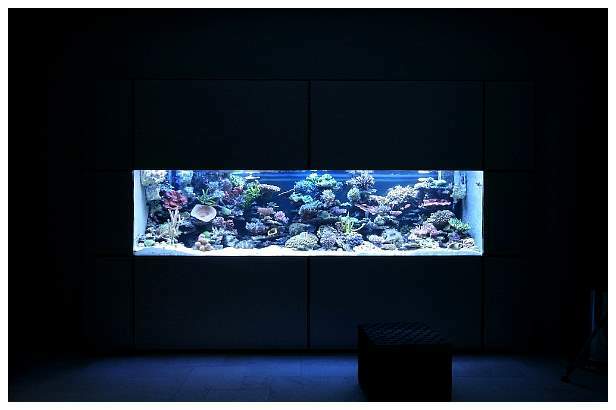 I wanted to have a cold-blue light but also enough PAR to reach the substrate, where I intended to keep some stony corals. 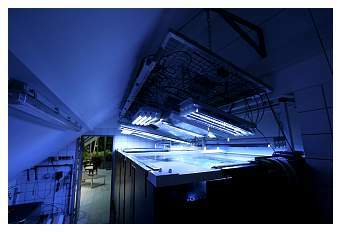 We decided to use a T5 / metal halide (HQI) combination. 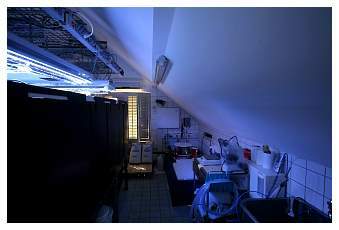 All of this lighting creates lots of warm, damp air in the room the tank is in, so there had to be a way to keep this heat and humidity under control. 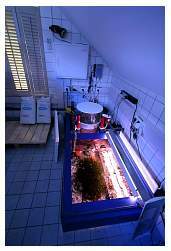 Thinking about the relatively small tank room that's occupied mainly by the tank itself and the sump, and heated by the light hood, the decision to cool and heat the whole room instead of the tank was obvious. 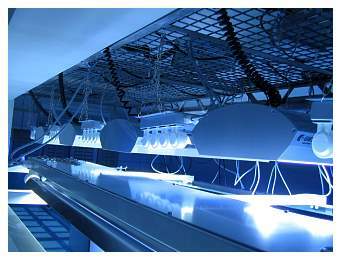 A Toshiba split-level air conditioner was installed in the room, guiding its air outlet just above the tank directly into the light hood. 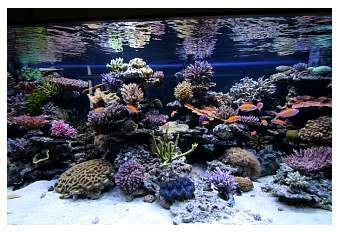 Keeping the room at a maximum temperature of 73° F (23° C), the tank barely reaches 81° F (27° C). This past winter I discovered that my air conditioning stops working at 32° F (0° C). That's generally not a problem regarding the room's temperature, but if the air conditioner is also the solution for the humid air created by the tank, I'm in trouble. I recently installed a Stiebel Eltron DL 13 fan (photo right) to vent the air to the outside. It has a cross flow heat exchanger which claims to exchange air while keeping 80-90% of the warmth inside. An additional fan runs in the wall between the tank room and the winter garden. 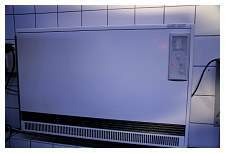 This fan produces low pressure in the tank room and ensures that the damp air is not creeping into the living room by moving the air in a different direction. The result is that the living room typically has less than 50% relative humidity. Skid-proof tiles on the floor and along the walls help keep the tank room clean and allow spilled water to be easily removed. 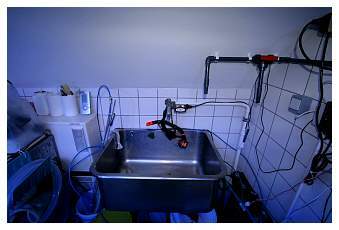 There is a sink in one corner and a small table where my microscope and a balance are stored. 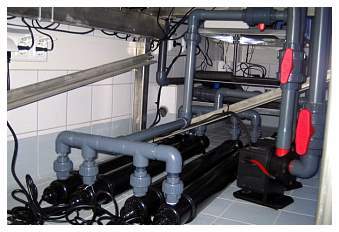 A reverse osmosis filter with automatic rinsing and a mixed-bed ion-exchanger are also located here. This area also contains several dosing pumps for different purposes that are screwed to the wall. 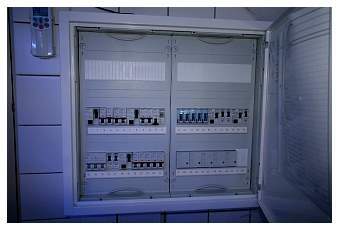 The electricity for this room consists of three independent circuits, each with its own GFCI (ground fault circuit interrupter), so it's highly unlikely that all equipment will stop working at the same time. As additional protection, two of the later mentioned Tunze circulation pumps are each connected to their own uninterruptible power supply unit (2200 VA). 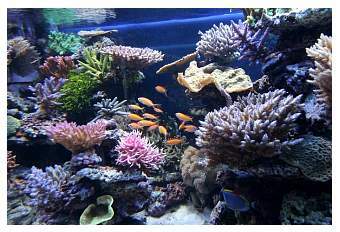 The 120-gallon glass sump is divided into two equal portions. 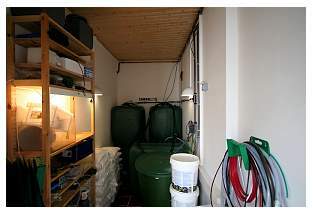 One houses a large Bubble King skimmer, the return pump, a filter sock, the measuring probes for the IKS-Aquastar and a level controller connected to a dosing pump for top-off. The Rowa fluidized bed filter is empty at the moment and is used for different absorbers/media as needed, such as ROWA®phos and carbon. 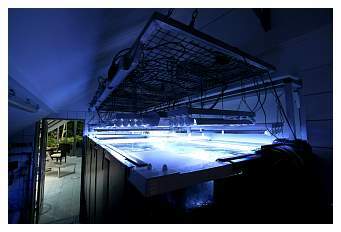 The second partitioned area is lit with two T8 bulbs that run only at night, and is populated mainly with Caulerpa and some coral fragments. 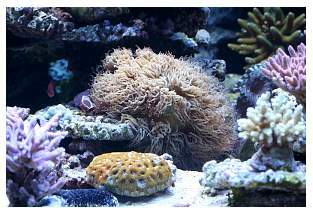 It also houses a bubble-tip anemone which I rescued from a friend's dying, freshly started tank that I helped set up. 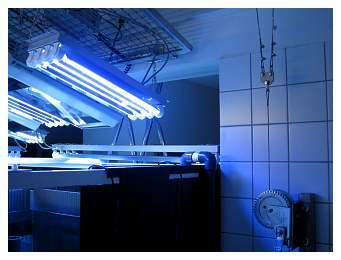 The UV-sterilizer, housing four 34-watt bulbs, is not connected here; it's on a bypass off one of the external circulation pumps. A Red Dragon return pump pushing about 3,700 gal/h (14,000 l/h), 30% of which is diverted into the Caulerpa filter. Two external Red Dragon pumps, each producing about 3,200 gal/h (12,000 l/h). Two Tunze waveboxes with "night mode." Two Tunze Streams, producing about 5,300 gal/h (20,000 l/h) each, with "night mode" capability that are located on the right and left sides of the tank, pointing toward one another. They run alternately with the right one set at 100% output and the left one at around 30% output, because the output from the Red Dragons is also coming from the left. 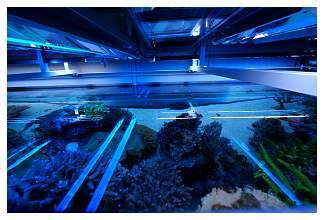 Two Tunze Streams at about 3,200 gal/h (12,000 l/h) each, with "night mode" capability that are located near the middle of the tank's back glass and hidden behind a reef-pylon; one points 45° to the right and the other points 45° to the left. They run alternately at a maximum output of 40%. 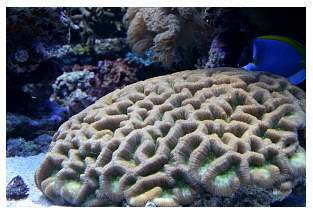 All of this provides up to 22,000 gallons/hour, which is about 25 times turnover, and this seems to be sufficient for the current reef structure. Using strong skimming, 98% live rock for decoration, a moderate fish count and Caulerpa in the sump, I find no issue with nutrient overabundance in the system. 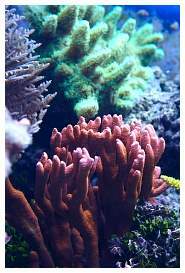 I perform a 50-gallon (one rain barrel) water change each week and use about one pound of activated carbon every three months for three days. Calcium, magnesium and alkalinity are kept at optimum levels using a modified version of the "balling" method, which is basically adding diluted chemicals to the water. I use peristaltic dosing pumps for this task, which allows me to keep the parameters where I want them. This method replaces the previously used calcium reactor and magnesium additions. 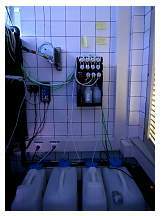 Having the above mentioned 11 channel Grotech dosing station, I also add a strontium/barium solution ("grow pusher"), PVP-Iodine and QFI-elements (at 10% of recommended dosage) automatically. 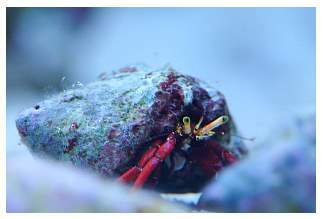 The reef is composed of 770 pounds (350 kg) of class-A live rock, pre-cycled at the importer and driven overnight to its current location. 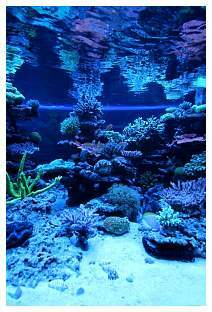 Live sand (320 pounds, 145 kg) gives the tank a nice white substrate. When initially setting up the system, half of the water was collected over several weeks from my old system by performing large water changes; the other half was mixed up some weeks prior to usage. 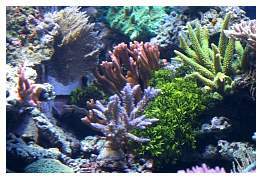 I manually feed the corals on occasion (every other day or so) with a phytoplankton substitute by Fauna Marin and a zooplankton substitute by Tropic Marin. 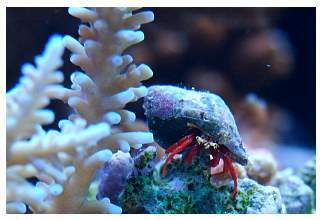 Additionally, the tank is dosed with amino acids. 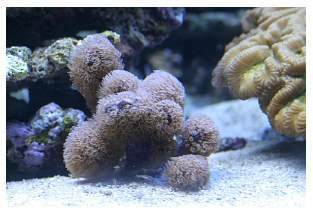 While I'm able to determine what an Acropora is and what's a Montipora, etc., I am not sure I'm able to precisely name them all scientifically, so please just take a look at the pictures and assume that these are my best guesses at their correct names in the lists that follow. The lists are sorted by the number of species kept. 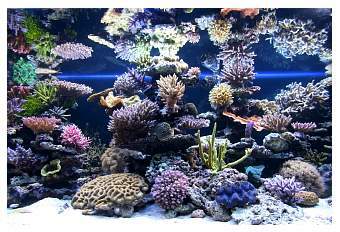 The sea fan is seen here in the upper left corner. 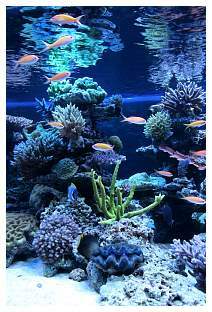 I trust in pushing the balance between fish and corals slightly to the coral side (meaning fewer fish than I could possibly keep). 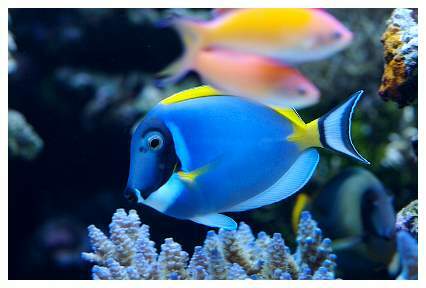 Feeding the fish shouldn't raise NO3 and PO4, nor should they die from starvation. 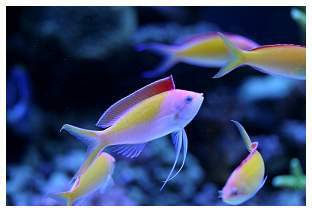 Having Anthias in the tank, I am feeding five times a day - three times with frozen Mysis and Artemia and two times with pellets dispensed by an automatic feeder. If I am away from home for a short time, they're fed four times/day by the automatic feeder. 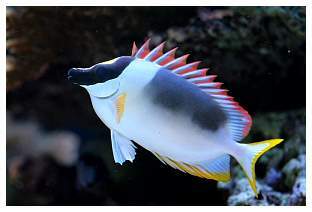 Adult Siganus magnificus (Magnificent rabbitfish)- I nearly forgot that he has poisonous fins (hurts really badly for days, I was told). 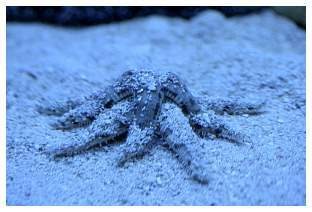 He never did anything to me, but it was a strange feeling remembering that his spines are poisonous while having my face in the tank wearing a diving mask to place corals and seeing him looking into my eyes! 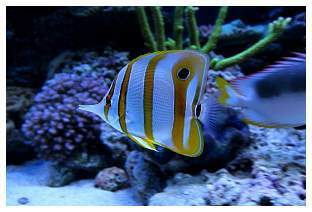 Nearly adult Chelmon rostratus (Copperband butterflyfish with no interest in Aiptasia at all). 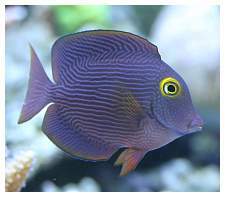 Adult colored Acanthurus pyroferus (Chocolate surgeonfish). 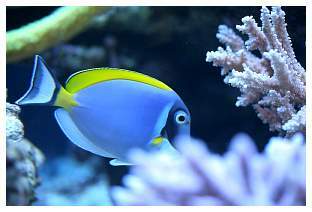 Nearly adult Acanthurus leucosternon (Powder Blue surgeonfish). 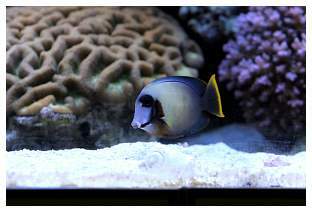 Adult Ctenochaetus strigosus (a Kole tang with a really bad character. It's a good thing that he'll remain small). 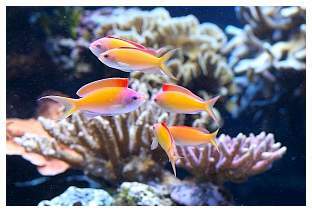 Five Pseudocheilinus hexataenia (Sixline wrasses to clean unwanted parasites from the corals), spawning once a week, the Anthias love that. 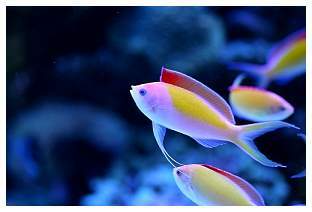 15 Pseudanthias dispar (2 males & one in the process of changing to a male... I think the group is already too big for one male to keep his women under control). 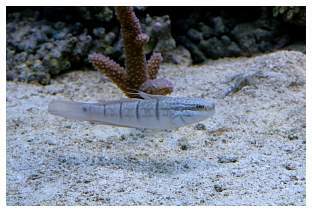 One Amblygobius phalaena (a Dragon goby; cleans the sand). 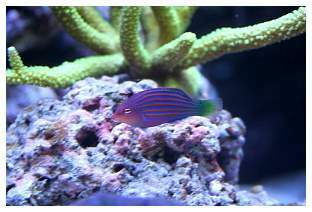 Initially there were two, but the Kole tang killed one (took 3 days). The system itself is running sufficiently. I can't say what I would have done differently given my experiences to date. Maybe it's too early to judge the long-term results after only a year. The sump could have been divided into different partitions instead of placing external filters with bypasses. 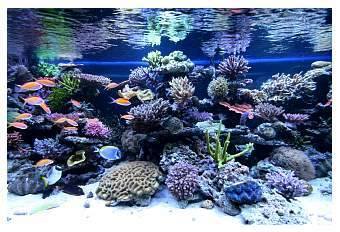 As described earlier, dealing with the humid air was already subject to change, as well as some minor issues with the RO/DI water (I measure TDS now before and after the ion exchanger to know when it is worn out) and other minor issues most aquarists change from time to time. Regarding the animals, I wouldn't have added the Kole tang - it seems I'm the only one who didn't know about their aggressive character. Future extensions/additions are already being planned. 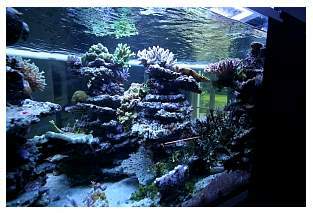 As the corals start to touch each other, I am building a small coral fragment tank above the sump's algae partition that will be lit with T5 bulbs. Thirty percent of the water from the return pump is already redirected to the sump's algae partition, so I can simply add a pipe to divert the output to the fragment tank first and from there back to the algae partition. 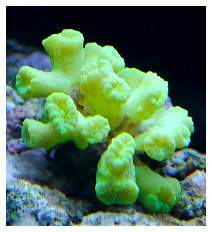 As I consider the sump's algae partition not being the best place for the green bubble-tip anemone that I rescued, I'm thinking about building a small tank housing only anemones and clownfish, and possibly trying to breed them. Well, this still needs some more thought. 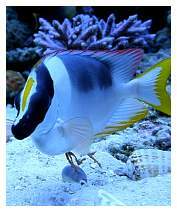 When breeding clownfish, and given that I have plenty of zooplankton here... why not try breeding Pseudochromis fridmani? I read an interesting article about it. Well, that needs even more thought. 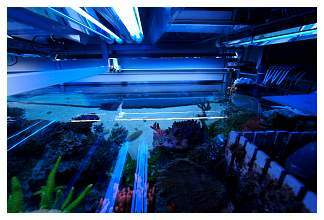 Having phyto- and zooplankton here, what about building a "Kreisel" tank with dim blue light in the basement and keeping jellyfish? 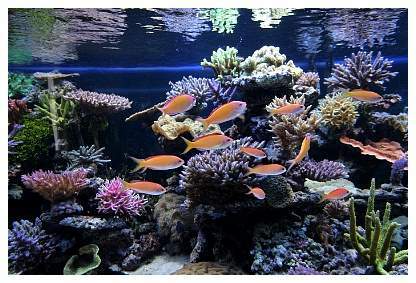 Well, that's even further in the future and needs more thinking and learning, but that's what reefkeeping means to me. There is no end to learning, trying to optimize the environment for the animals while still having fun looking at them and sharing the knowledge. Michael Mrutzek from Mrutzek's Meeresaquaristik, a longtime friend of mine, who gave me advice, did some of the planning and supported me with his active assistance. 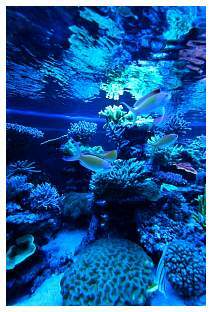 Michael is a well-known aquarist on Germany's reef scene, having operated a reef-dedicated local fish store for more than 20 years now. 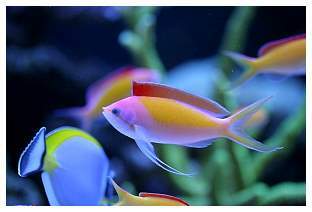 Claude Schumacher - you might know him from his company, Fauna Marin - also did some of the system's planning and we ordered the tank from him. Ralf Geis glued the tank in its current position... Man, what a craftsman! 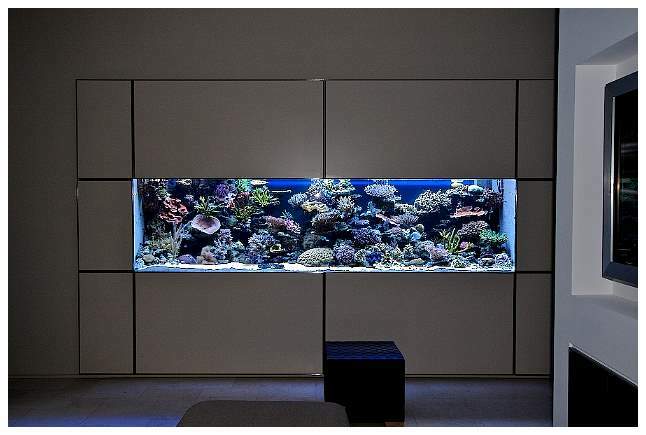 Many thanks are due to Hennings & Boern, the guys who helped plan the home renovation, and who had some tremendous ideas to make the tank blend well with the rest of the house's décor. The high-grade stainless steel stand, cladding and air conditioning were all done by other companies, and they did a fantastic job. I'd also like to thank my wife, who prevented me from going mad during all of the construction and for not saying one negative word about it! 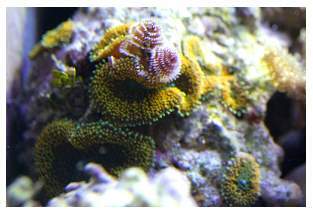 Also, many thanks to Reefkeeping Magazine and Reef Central for giving me the chance to share my setup with you. 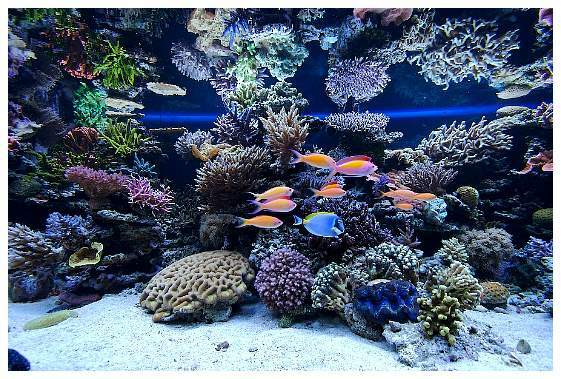 Special thanks to the editorial staff at Reefkeeping Magazine, who did a great job in editing this article and in finding the right words and expressions to make the article more readable (German is my native language). And last, but not least, thank you, dear reader, for actually being the one I am sharing all this information with. For more information, visit Ralf's website. 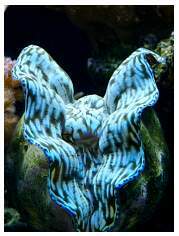 Feel free to comment or ask questions about my tank in the Tank of the Month thread on Reef Central. If you'd like to nominate a tank for Tank of the Month, click here or use the button to the right.